Got a spare minute? Interested in employment and skills? Our One Minute Mondays are the blog posts for you! Many of the skills missing from UK employees are people and personal skills. When we asked employers who said their employees were lacking required job skills what those missing skills were, employers mentioned ‘personal' skills more often than technical skills. According to employers the top two skills lacking in the current workforce are the ability to manage time and to work as part of a team. In some ways this is not a shock– everyone knows in job interviews you’re bound to get asked about working in a team and using your time effectively. But what may come as a surprise is how many employers thought these skills were absent from at least some of their workers. Nearly 3 in every 5 of those who said their employees were lacking skills identified an ‘ability to manage own time and prioritise tasks’ as missing. 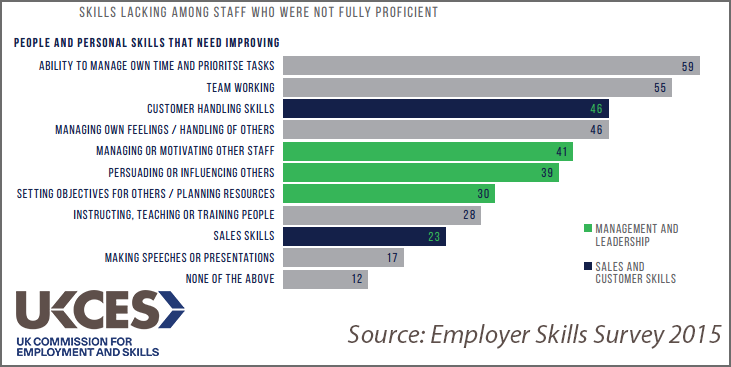 Similarly, more than half of the employers we asked said their employees were not fully proficient at ‘team working’. Other commonly identified skills deficiencies related to management and leadership, and sales and customer skills. To find out more about the skills in the UK Labour market read our full Employer Skills Survey results for 2015. What are your experiences of missing skills in the workplace? Or are there skills you have that you don’t think are fully used in your role? Let us know on twitter (@ukces) or comment below. One Minute Monday: skills training, who gets it?